OK... it's time to get serious. I've had a lot of great pizza in my day, with a lot of favorites for different reasons. There's the broccoli rabe pizza at Delfina, in my old 'hood in SF (which I never managed to blog about sadly). There's the delicious white clam pizza at Pepe's here in Connecticut. The famous margherita pie at Tony's in San Francisco. 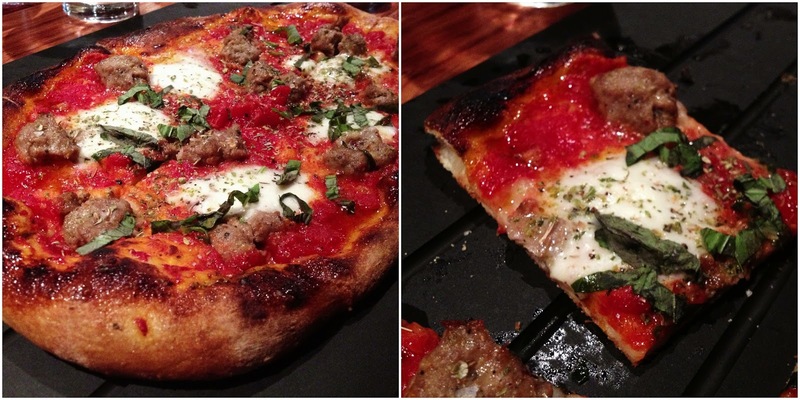 Flour + Water, Zero Zero, and Pizzeria Bianco all would make my Top 10 list as well. 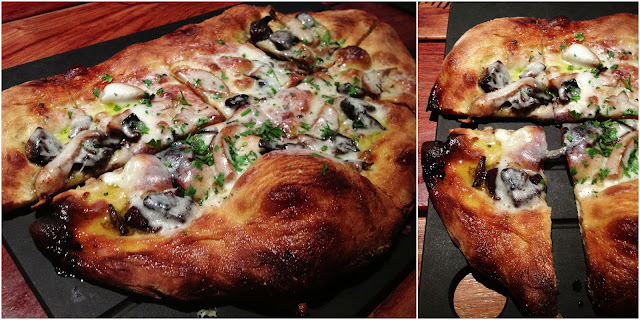 But on my recent trip home to the West Coast, I had the pleasure of dining at this Tom Douglas restaurant and it's definitely at or near the top of my all-time favorite pizzas. We started off with a couple of appetizers. 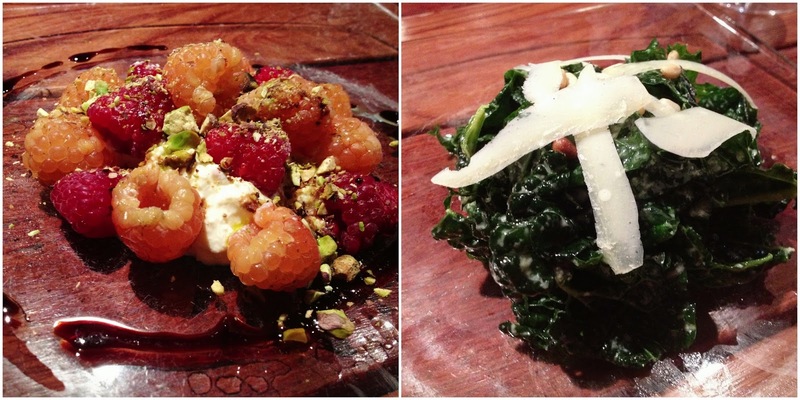 On the left is red and golden raspberries served atop Bellwhether farms ricotta, sprinkled with pistachios and drizzled with balsamic. I loved this dish and could've eaten it for dessert had there not been some serious dessert to go along with our Serious Pie. We also ordered this marinated lacinto kale with calabrian chiles and pine nuts. I loved this because I love all things kale, but I would've liked to have more of the chiles featured instead of just a couple. But who are we kidding? You don't come here for the kale salad. You come here for the pizza. We got two to share between me, my mom and my sis. Our theory was that we wanted to try more than one, and if we had extras leftover, we'd bring some home for Shaun (Heather's hubby & "BIL"). Ummm... yeah sorry Shaun. There wasn't so much as a crumb left over after we were done. Our favorite was one we sort of created on our own. We ordered the pizza that featured buffalo mozzarella, red sauce and fresh basil and added some of the sweet fennel sausage we saw on another pie. SO GOOD. 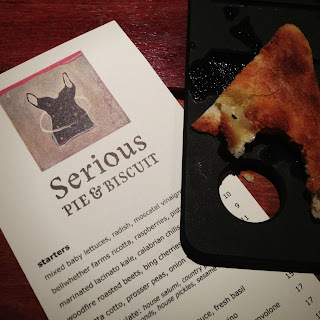 This is my favorite pizza combo ever, and Serious Pie did not disappoint. So simple, yet so flavorful. I love how they serve the pizzas on these beautiful black boards. I love how the crust bubbles up and blisters, thanks to their 600 degree stone-encased, applewood burning oven. I love how it's thin, but not flimsy. I love the fresh ingredients. I love, I love, I love this pizza. Our second was a wild mushroom pie that I think was on the specials list. It was equally as good, but a little more rich and complex than the simple tomato sauce pie. I loved them both, but I could eat that sausage pizza every day and never get tired of it (though I might weigh 500 pounds at the end of the year). 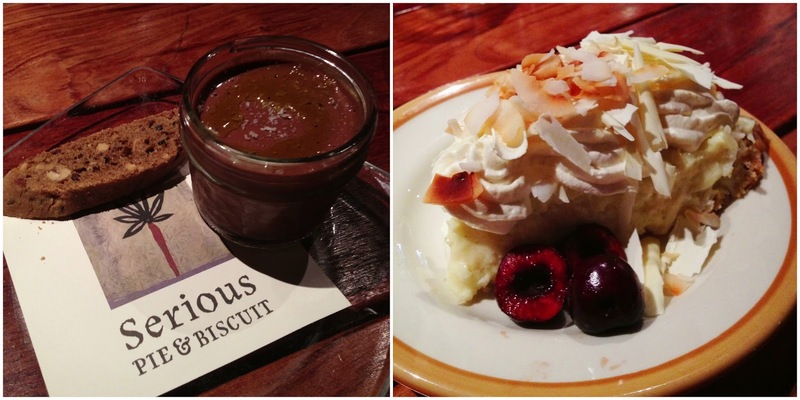 The desserts were equally as decadent. Originally, we were only going to order one, the chocolate budino. This was reminiscent of the one I had at Flour + Water. I'm pretty much obsessed withe the idea of a chocolately custard sprinkled with sea salt and drizzled with olive oil. It's one of my favorite dessert combinations. We were also swayed into getting the coconut cream pie by our charming waitress, who had us laughing all night. The coconut cream pie is not on the menu, but it's one of their signature desserts and we were definitely glad she suggested it. Creamy coconut filling topped with fresh coconut shavings and almonds, and served with fresh cherries. Again, we stopped short of licking our plates. Needless to say, Shaun did not get any leftovers. Serious. Those pizzas look amazing. I wish we had the food talent in my town to create something even close to that. yum!